Buying a Haritha Home is a really simple and pleasant experience. All our transactions are transparent. All queries concerning the campus will be answered promptly and accurately prior to signing a contract. You are most welcome to visit our campus at your convenience, and then you can rest easy seeing the nearly completed campus and be reassured by interacting with the satisfied residents who are already part of the Haritha family. The Haritha team will support you throughout the entire first-time home ownership process, ensuring that you are a satisfied customer, happy to have chosen one of our units. 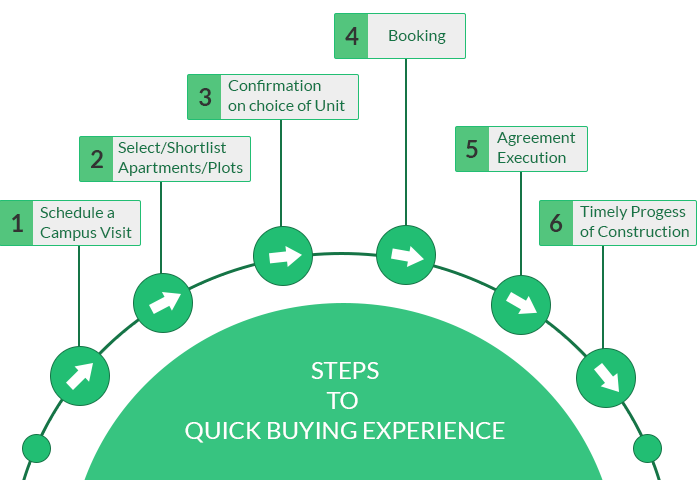 Here are the main steps in your Haritha experience. Step 1 : Schedule a Campus Visit. First installment as per agreed payment schedule.